Monday, ice that caused closings and delays. Tuesday, an accident. Wednesday, another accident. Thursday, flooding that closed two of the three routes I can take to work. Today, I have no idea what the problem was, but it slowed traffic to a crawl and turned my 40-minute commute into a 70-minute pressure-cooker. But I still got a premium parking spot—on the end where I can park far enough from the next spot so that no one will ding my doors or scrape a bag the entire length of my car, which happens with frequency in a large office building where everyone is in a hurry. That means that I was one of the earliest arrivals. And yet when I arrived, all five secretaries in our office suite were already at their desks, cheerful and welcoming. As the staff of teacher specialists and supervisors straggled in, the secretaries greeted us with unfailing optimism. And once everyone had arrived, one secretary brought out heart-shaped donuts glazed in chocolate in celebration of another secretary’s birthday. Another made a chocolate chip pie from scratch, which the birthday celebrant shared with everyone in the office. At lunch, the secretaries all gathered around a desk in the center of the open space where they all work to have lunch together. But they never left the office, as the rest of us do when one of us has a birthday, and they interrupted their lunch to take turns answering the phone whenever it rang. When I worked in a school, I thought that those who worked in the district office took long lunches at fine restaurants. I was wrong. The last time my team went out to lunch, a distant memory at this point, we went to a chain sandwich place for a team member’s birthday and were back to work within an hour. And even that is more time than the secretaries take—ever. The school system just paid Gallup to conduct a survey about the engagement of our work force. When we filled out the survey, we all laughed at one question, which asked us to strongly agree, agree, disagree, or strongly disagree with the statement, “I have a best friend at work.” When we talked about it, most people rolled their eyes and said that they stopped using the term “best friend” after adolescence. I use the term—to refer to my husband and one or two very dear friends. But most of my colleagues, especially the men, said they didn’t use the term at all. And while I found myself wondering how much the school system paid Gallup to do the poll, I was curious about the results. As you can imagine, that question had, by far, the lowest rate of agreement. So, no, I don’t have a best friend at work. 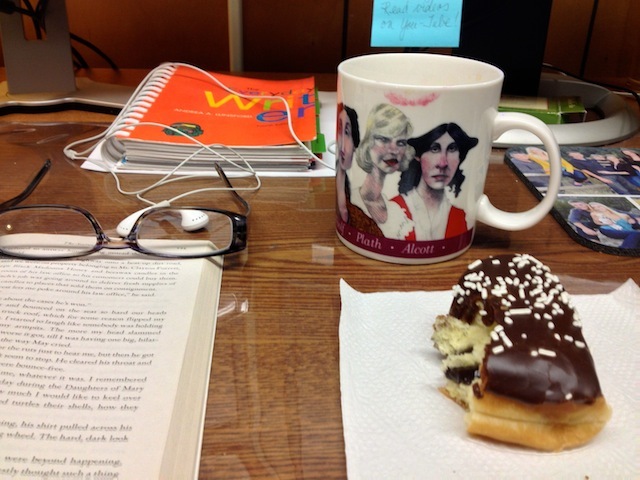 But this morning, I was grateful for the secretaries, who always ask how my morning is going and who gave me a heart-shaped donut with chocolate frosting on a morning when I sorely needed a pick-me-up. So tomorrow it’s back to a healthier diet….as soon as I leave the pasta cooking class that I’m going to in the afternoon with three of my bestest friends—my daughter, my sister-in-law, and my niece. But it’s nice to get through the week with colleagues who, while we may not be best friends, care about each other. So tell me your stories of friends, good friends, and best friends. Previous PostPolitician or Leader?Next PostBelieve in Unicorns?